The game begins with each player being dealt four "hole" cards, after which there is a round of betting. 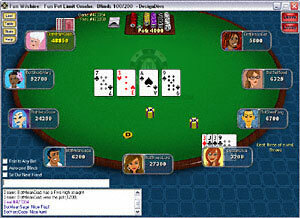 Three "community" or "board" cards, referred to as the "flop", are then turned face up simultaneously, and another round of betting occurs. The next two "board" cards, respectively, the "turn" and "river", are then turned face up one at a time, with a round of betting after each one. In all fixed limit Omaha games, the smaller bet is wagered on the first two betting rounds, and the larger bet is made on the latter two. For example in a $1/$2 Omaha game, the smaller $1 bet is wagered pre-flop and on the "flop", with the $2 larger bet made on the "turn" and "river". After the final round of betting, a player must use exactly two of the four "hole" cards in combination with three of the "board" cards to form a five-card hand. Determination of winners follows standard Hand Rankings. In Omaha, a disc also known as the "dealer button" indicates the person that is the theoretical dealer, even though that player does not deal the cards. Prior to players receiving "hole" cards in Omaha "blinds" are posted. The player immediately clockwise from the dealer button posts the small blind equating to half a small bet ($0.50 in a $1/$2 game). The next available player immediately clockwise the small blind posts the "big blind", which is a full small bet ($1 in a $1/$2 game). Players then receive their "hole" cards. Betting action proceeds around the table, commencing with the player immediately clockwise the big blind. On all subsequent betting rounds, the action will begin with the first active player to the left of the button. If there is more than one active player remaining when the final betting is completed, the last bettor or raiser shows their cards. The player with the best five-card hand wins the pot and if two or more players have identical hands, the pot will be equally divided amongst them. The button now moves clockwise to the next player and another hand begins. As in Texas Hold’em, CardRoom offers Omaha games in Limit, Pot Limit and No Limit variants, which can be identified by looking under the limit column, in the Omaha game lobby. For details on the difference between these types of games, click here. (link to limit pages). Check out the Interactive Help section for information on all of our cool game features. If you still have questions, try visiting the FAQ page or contacting one of our friendly customer support representatives.